Hello, eager learners! After posting about some bizarre Russian tradition in celebrating Maslenitsa, we are back with even more exciting facts about the celebration. Every year, the end of February marks the ‘pancake week’ or Maslenitsa in Russia. People also nickname the week-long celebration the ‘butter week’. Russian usually celebrate Maslenitsa with tons of good food and lots of dancing. Without further ado, let’s find out more about Maslenitsa, the meaningful and festive ‘Butter Week’ in Russia. People have celebrated Maslenitsa in Russia for a very long time. Some archaeological evidence even suggested that it dated back to the second century. The interesting fact is, the tradition has not changed much over the centuries. A whole week is for celebrating Maslenitsa in Russia to welcome the beginning of spring in the region. The extend Russian go to celebrate the beginning of spring would come as no surprise as they have to survive 6 to 7 months of very cold Russian winter each year. Blini is indeed an important and inseparable part of celebrating Maslenitsa in Russia. The legend has it that Russian eat blini during Maslenitsa as its round shape resembles the sun. In Russian tradition, the sun itself is personified by a very powerful god named Volos. By eating the pancakes, Russian believe they would consume the warmth and energy from the sun. They would try to eat as many blini as possible, especially before the seven weeks prior to the Great Lent. 3. Let’s bring out all the blini and feast (but not on meat)! During the whole week of Maslenitsa in Russia, people would eat meatless. Russian believe that it is a method of purification as meat signifies aggression and lust in human. Linguists have also suggested that “Myasopusta” which literally translate into ‘meatless’. They believed it might be the original name of Maslenitsa, although the word is no longer in use now. In fact the celebration was called ‘Maslenitsa’ a.k.a the ‘butter week’ later in the 17th century, after the Orthodox Christian church officially recognised and added Maslenitsa as a part of Christian holidays. Prior to that, Christians in Russia would only call the last week before Lent as ‘meatless’. The unclear origin of the celebration raised many theories about it. One of the popular speculations is that Maslenitsa came from an ancestor worshipping tradition from ancient Slavic time. Back in the days, Russian believed that when spring was approaching, the portals of the living and dead’s world came closer. They said, blini was first served as an offering to the ancestors. These ancestors, they believed, would be able to visit the world of the dead during the period. The thin shape of blini symbolised the thin barrier or gate separating one world from another. People can break both social and natural rules during the week-long celebration of Maslenitsa in Russia. The traditional Russian jargon even calls it as the ‘threshold time’ where these rules just do not matter that much. The multi-day celebration consists of a day for sharing blini with your beloved ones, another day for sharing blini with the poor, and another day where mother-in-laws cook blini for their daughter-in-laws. Mind you, those are not all. Before the celebration goes by the name ‘Maslenitsa’, it went by ‘Komoyeditsa’. The name again sparked some more theories about the celebration’s origin. One of the popular beliefs said that, the beginning of spring was the time where bear woke up from their hibernation. Russians referred bear as ‘kom’. As they considered bear as the ‘master of the jungle’, they would make blini and bring the pancakes as offerings for the bear. It was a way of greeting spring back after the long, cold winter days. That is why people interpret Komoyeditsa literally as ‘feeding the bear’. The seven-day long festival is also the last week Orthodox Russian can consume dairy products before the Great Lent. That is why, While not indulging in meat, Russians eat plenty of blini. The buttery and rich pancake is also significant part of the tradition. There is a famous saying about eating blini which said we have to eat as many times as a dog wags its tail throughout the celebratory days. Unlike other holidays where Russian would flood the country with flowers (of course in odd numbers), Russian would have tasty pancakes and butter with various toppings to indulge in. They really celebrate Maslenitsa in Russia with great amount of good foods, drinks with fistfight and snowball fights following afterwards. The week of Maslenitsa in Russia is indeed one of the best times to visit the country. Every city, especially the major ones like Moscow and of course the famous St. Petersburg, would hold various activities to welcome spring in Russia. From calligraphy workshops, music and theatrical performances, to street games and snow sledding would be ready for tourists to enjoy. 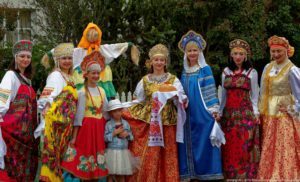 Some travel agencies even have special packages for tourist to visit the country during Maslenitsa. Now you know one of the best time to visit Russia and all the goodness prepared to welcome you in the country. Hurry book your ticket and join the fun!